Today, it’s beautiful though and I am hoping that it lasts all day! We need to break this trend and start a new beautiful day streak! 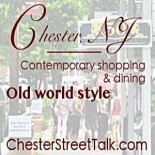 This entry was posted on June 9, 2018 by elegantparis in Chester Business, Chester Merchant Association, Chester New Jersey, entertainment, Farms, Nurseries & Parks, Other, Restaurants, Shopping and tagged Chester NJ, shopping and dining chester nj.